Who loved The Lego Movie? My favorite part is the instructions for fitting in at the beginning. Emmet is just so darn cute! When Expressions Vinyl said the theme for this month’s Ambassador (sponsored) post was going to be the Lego pack of heat transfer vinyl, I was so excited! Our oldest nephew has started bringing Lego projects over when he comes to visit, so I decided to make him a special Lego backpack with a coordinating pouch with my heat transfer vinyl(HTV). I’ve done tutorials on using heat transfer vinyl before, so I thought I’d change it up and show you my actual vinyl design process in the Silhouette Studio software today. I am NOT a pro at any kind of graphic design, so had to figure out how I could use the software to still make fun projects. This process is great for anyone who needs help visualizing what they are working on before cutting. I started with a gray drawstring backpack & pouch, plus the red, yellow, and blue HTV from the Lego pack. The pack also comes with a great green. 1. 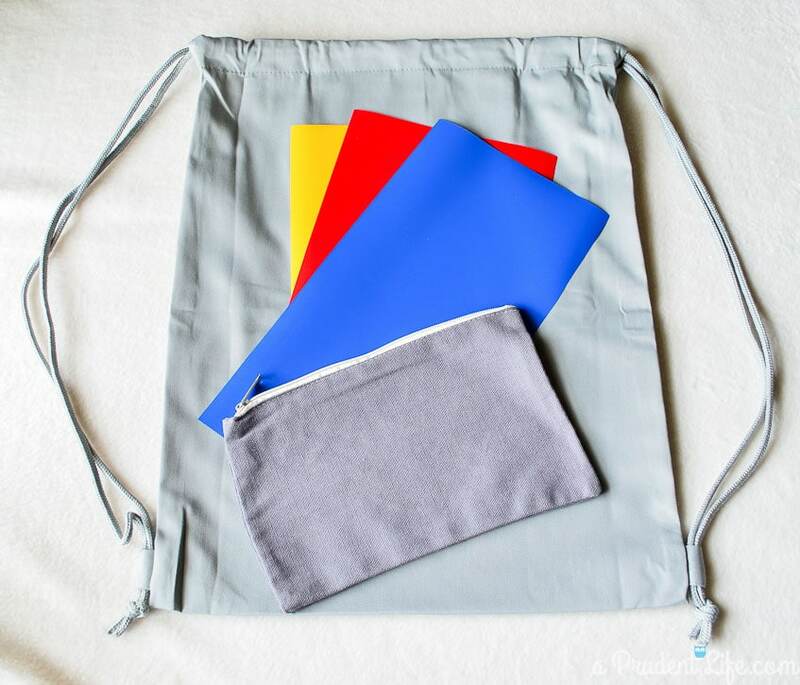 My first step is always measuring the product I am applying vinyl to – in this case a gray zipper pouch. 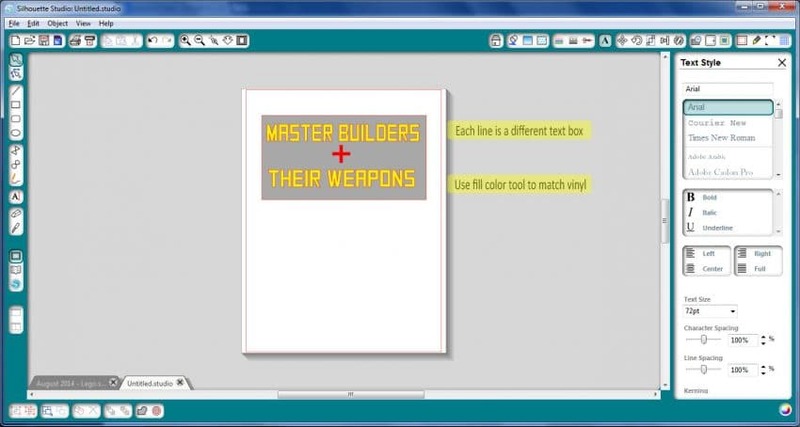 Then I use the shape tool in the software to “draw” my product in the software. I draw the background to scale even if it is bigger than the cut area. 2. 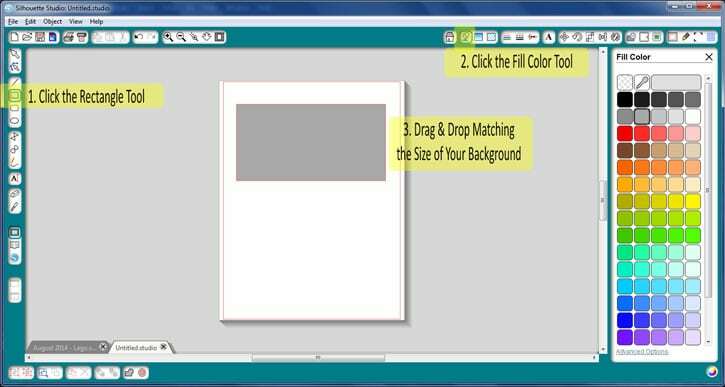 Use the fill color tool to pick a color that matches your product – it is so much easier for me to visualize when things are as realistic as possible. 3. Drag and drop to make your background. 4. Type in your text, using a separate text box for each line. It is SO much easier to play with spacing and mix fonts when each line has it’s own properties. 5. 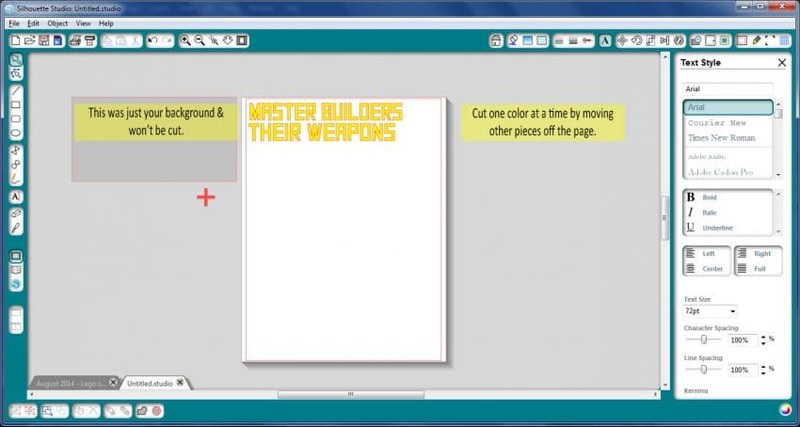 Color your font to make the vinyl using the fill color tool. This won’t affect your cutting, but makes it easy to test out color combos without wasting any vinyl. 6. When you are happy with your design and ready to cut, move your background off the cut area. You’ll just want to leave one color worth of text on the page at a time. IF YOU ARE USING HEAT TRANSFER VINYL, DON’T FORGET TO MIRROR BEFORE CUTTING!!!! That’s my process! When I started using the fill tool and drawing my background, designing vinyl projects has been so much easier for me. My finished product is very similar to the design on my screen. 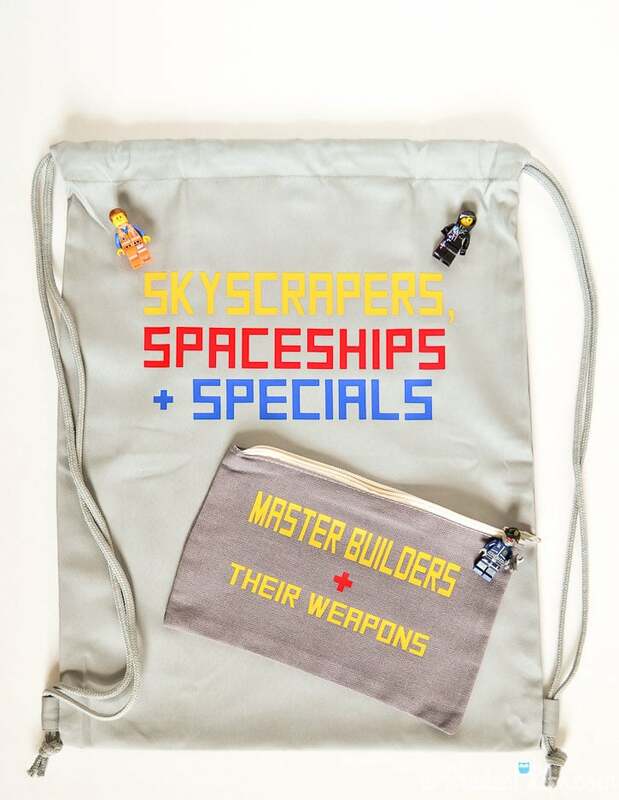 I can’t wait to add a Lego pack to the bag and give it to my nephew! If you have a Lego lover in your family, three other bloggers also have fun Lego HTV posts this month. 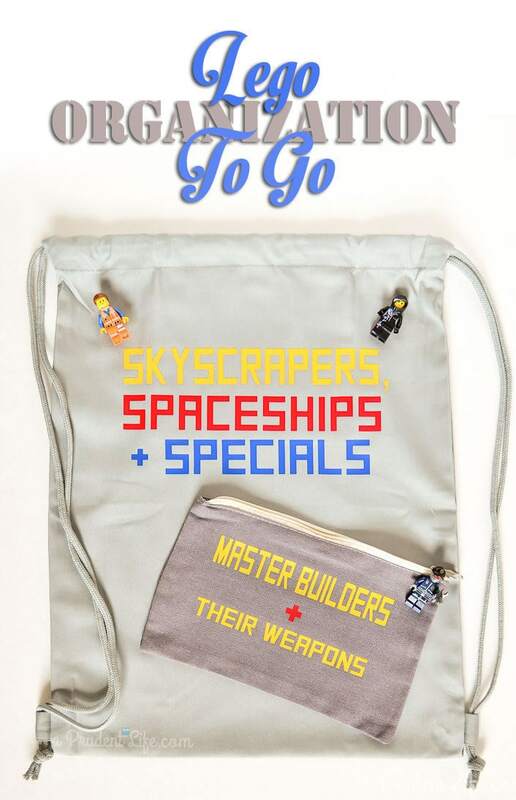 Ashley from Simply Designing made some cute The Lego Movie phrase shirts, McKenzie from Girl Loves Glam created an adorable falling brick shirt, and Jessica from Everyday Party Magazine made a Lego man tote bag. 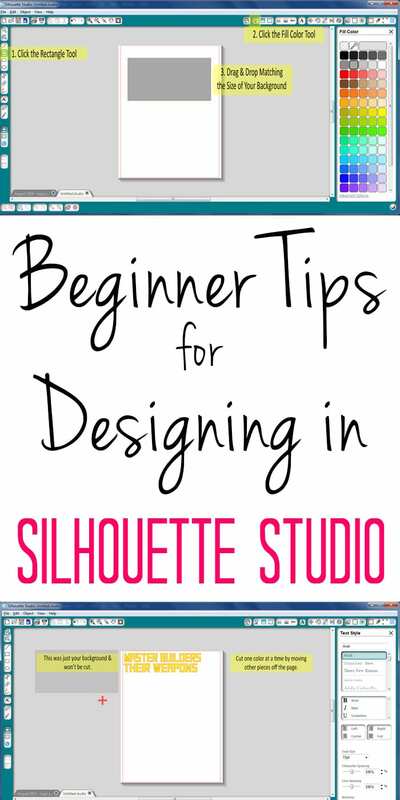 Looking for more Silhouette projects? Here are my favorites! For even more inspiration, make sure you are following my Silhouette Pinterest board! Follow A Prudent Life’s board Silhouette Project Ideas on Pinterest. My favorite Lego memory is tower competitions against my sister. Whoever could build the highest won! Great giveaway… Expressions Vinyl is great. I order from them often! Tower competitions sound fun! And I’m glad you love Expressions Vinyl too. I love the products and everyone I have worked with there has been genuinely super nice! I never really played with Legos as a kid, but I love to sit and build with my kids! My daughter had a set of legos as a child. They were actually for little girls and were pink and lavender. Thanks for the chance to win! Oh that sounds fun – I’d like my own pink set! Love these Lego projects! I remember building princess castles and was a little upset because all the Legos we had were boy colors, lol. My son loves Legos. For sure I’m trying this. The shirt is so cute. My favorite lego memory is road trips growing up it always made the trips not as boring. I would get car sick and couldn’t read or watch tv but Legos never made me sick. As kids we would compete for the tallest lego tower without it falling. I remember sitting in my room playing with legos for hours. Wow, love the Lego projects! We are Lego fanatics here in our home so this post is just amazing!!! Love everything you did! This is so stinking cute!!! I have to try this technique and made some stuff for my boys!! We just bought the Lego movies yesterday and it’s been on repeat ever since. Love this project! So creative, Melissa! We also just got this movie, and I think my boys have it memorized! And … we have legos all over the house at all times. Even when I think we’ve picked up well, I’ll find them in crazy places! Ugh. Oh well. My favorite memory with Legos is getting to spend time with my kids and grandkids. We would have Legos all over the floor!! My favorite lego memory is watching my boys playing with legos and seeing the excitement on their faces each time they were lucky enough to receive a new set! My memory of Legos is the first time we learned the little Legos fit on top of the big ones. It opened up a new building world. I love all your examples. I would love to make a shirt with the big Legos on the bottom stacked with the smaller ones on the bottom.